I know, I know. I am a really rubbish food blogger at the moment. It seems that planning a wedding and writing a food blog don't really mix. Actually, it would appear that planning a wedding is an all-consuming activity in its own right. I'm really enjoying it all, but I'm very much looking forward to life returning to normal soon too. However, I had some friends over during the week and I leapt at the opportunity to actually cook something, so thought I'd try something new. Cooking en papilotte was a revelation. I was initially worried that the chicken would be a bit dry as it had little more than its own juices and some olive tapenade to keep it moist. However, my fears were unfounded and out of a little paper parcel emerged the most succulent chicken breast I've eaten in ages. I served this with ribbons of courgette, broad beans, wilted spinach, couchillo olives and a basil dressing. One of my favourite things about this time of year is the reappearance of all my favourite vegetables, and they worked beautifully alongside the delicious, Mediterranean chicken. Preheat the oven to 200°C. First, make the basil dressing. In a blender, blitz together the basil, crushed garlic, lemon juice and olive oil until you have a smooth dressing. Season to taste with salt and pepper. Make a cut in the side of each chicken breast to form a pocket, then place one teaspoon of tapenade in each pocket. Spoon a teaspoon of the basil dressing over each chicken breast, then place a quarter of the butter (thinly sliced) and 2-3 thin slices of lemon on top of each breast. Cut four sheets of approximately 8"/20cm baking paper and brush the inside with a little olive oil. Place the chicken breast in the middle of each sheet, gather the paper together and roll until it covers the chicken and then gather up the sides so no juices escape. Bake in the oven for 25-30 minutes, until the chicken is cooked. While the chicken is baking, thinly slice the courgette lengthways using either a mandolin or a potato peeler, then fry in a hot pan with a little oil until soft and just starting to turn golden. Boil the broad beans for 3-4 minutes, until just tender, then blanch in cold water. Place four plates in the oven for the last 2-3 minutes of cooking time and then once the chicken is cooked, place a handful of spinach on each plate, divide up the courgettes and broad beans, scatter the olives over the vegetables and spoon a couple of dessert spoons of the basil dressing on top. 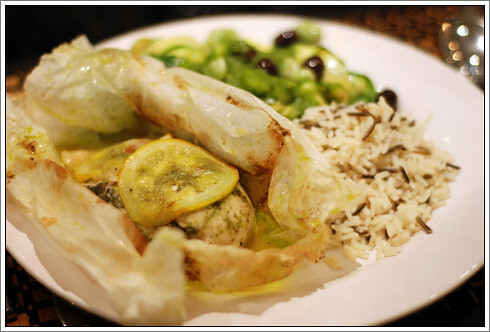 Place the chicken in paper alongside of the vegetables and devour immediately. Congratulations on getting a post up, and such a delicious one at that! I can only imagine how stressful and busy it must be planning a wedding, but I'm sure it will all be worth it in the end! But what a good post it is! A way to make me actually want to cook chicken breast. What a gorgeous idea. Simple but looks very fancy. I'm bookmarking this one!